The Gay Gamer: Would I like another helping of 7th Dragon? Yes, please! Would I like another helping of 7th Dragon? Yes, please! 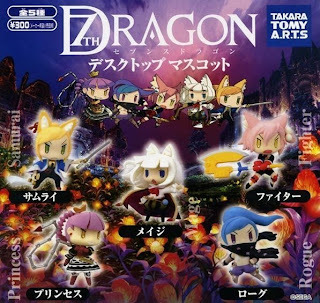 I know, it seems cruel to mention a 7th Dragon sequel when the original has yet to hit European or North American store shelves. The word on the street suggests that will happen sometime this year, though, so don't get too depressed about the following piece of news. I don't know what these are, but I want them anyway. Basically, Cubed3.com is reporting that the latest issue of Famitsu magazine mentions that 7th Dragon director Kazuya Niinou "wishes to work on a sequel" to the imageepoch-developed, Sega-published title that has sold 140,000 units since its release last year. I'd prefer to hear Niinou say the title is in the works and will be released in a matter of months but, as always, I'll take what I can get.